Recipe makes one 7-inch (17.5-cm) three-layer cake. Preheat oven to 180°C (350°F), with a rack set in the middle of the oven. Lightly grease and flour three 17.5-cm | 7-inch round cake pans, set aside. Sift flour, cocoa powder, baking powder, baking soda and salt in a medium mixing bowl. Stir to combine, set aside. In another large bowl, or bowl of your stand mixer, beat oil and sugar on medium speed for 2 minutes, until the mixture looks like wet sand. Beat in vanilla and eggs one at a time. Stop and scrape down the sides with a spatula. With speed on low, beat in flour and milk in 3 batches, starting and ending with the flour mixture (flour – milk – F – M – F). Scrape down the sides again. With the mixer on low-medium, slowly pour in the coffee and beat to combine, but no more than 30 seconds. Evenly divide the batter between the three pans. Bake for 20-25 minutes or until a toothpick inserted into the center of each cake comes out clean. Let cakes cool on a wire rack for 10-15 minutes, then remove them from the pans and let cool completely. As the cakes bake, make the rum syrup: Combine sugar and water in a small saucepan and cook over medium heat for about 5 minutes or until the sugar completely dissolves. Add rum and bring mixture to a boil. Cook for about a minute, then remove from heat and let cool completely. Combine chocolate and 1/2 of cream in a large heatproof bowl and place over a saucepan of simmering water (don’t let it boil), set over medium heat. Cook like that, stirring occasionally, until the mixture is smooth and warm. It should look like a silky soup. Remove from heat. Cool in the fridge for 30-60 minutes, until the mixture is thick but still spreadable (like smooth peanut butter or Nutella). Once the ganache has hardened a bit, whip the remaining 360ml (1 1/2 cups) of cream. Using a stand mixer, or a hand mixer, beat cream on medium-high speed until medium-stiff peaks form. Using a spatula, fold 2/3 cup of ganache into the cream. Be careful and don’t overmix. First level cakes if necessary, then choose one as the first layer. Place it on a cake plate and lightly brush with the rum syrup. Next, spread about 1/3 of ganache all over the cake, using an offset spatula or spoon. Top with 1/2 of ganache-whipped cream. Cover with next layer of cake and repeat the steps. Top with last layer of cake, lightly brush it with rum syrup and remaining ganache. – At this point, you’ll have some whipped cream peeking out at the sides. Using a spatula or scraper smooth the sides. Chill the cake for about 2 hours – this will harden the cream and make the cake more stable. Once the cake has been chilling for about one hour, make the second ganache the same way you made the first one, by setting up a double boiler. Once smooth, chill ganache until it reaches your desired consistency. Spread ganache evenly over the cake, top with sprinkles and chill for another hour or overnight. 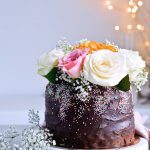 Decorate with flowers, if desired, before serving the cake. A soup ladle or scoop is great for dividing the batter between the cake pans and making even portions. If your oven is on the smaller side or you only have 1 pan, bake each cake on its own. You can wrap cooled cakes in plastic wrap and store at room temperature overnight, before you continue with making the cake. Alternately, you can double wrap them and store in airtight containers in the freezer for up to 3 months. For a smooth cake, you’ll want to pour ganache over the cake. Chill ganache until it’s lukewarm and still has a very soup-like consistency, then place the cake on a rack set over a baking sheet and slowly pour over the ganache. Chill in the fridge until hardened. For a rustic finish, chill ganache until it’s a bit more thick (like peanut butter or Nutella). Take cake out of the fridge and gently spread ganache all over with an offset spatula, as even as possible.